You can customize your own preset of columns in any list such as All Clients, All Groups, All Accounts, Journal Entries or Transactions Lookup. 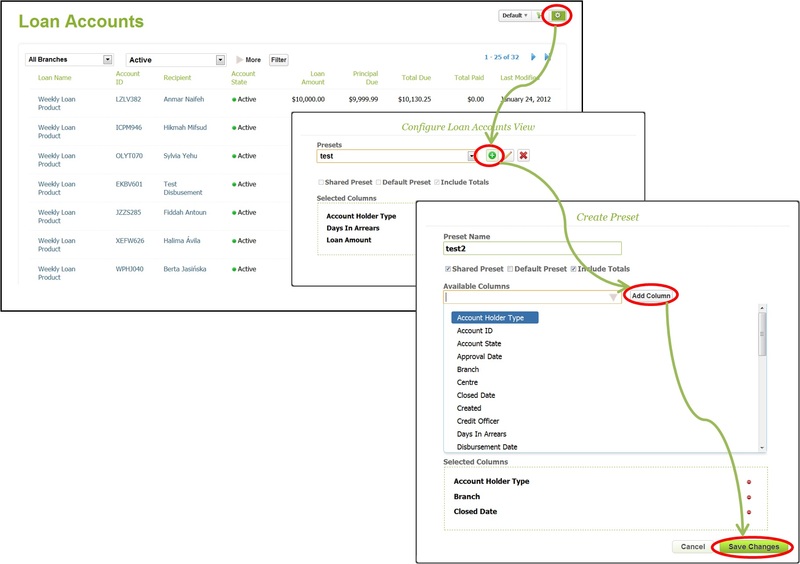 The customizable sets of columns allow you to have specific perspectives of your data according to your own needs and in a more efficient way. To create your own set of columns from any of the lists, open the list > click on the Settings button on the top right > click on the Plus button to add a new preset > enter the preset's name > select the type of preset > click on the dropdown menu > click on a column you want to add > Add Column > repeat the process for every column you want to include and Save Changes. The columns include regular and custom fields. include Totals if the columns should display the total amounts in the end. You can change or delete existing presets at any time. To edit a preset of columns, open the preset > click on the settings button > click on the Edit button > make the changes > Save Changes. To delete an entire preset of columns, just open the preset > click on the Delete button > confirm that you want to delete it.